Adopt a Greyhound. Greyhound adoption. Home. Welcome to our web site, to view it full screen press F11. We hope you enjoy looking around it and seeing our beautiful dogs who are looking for their forever home. Although we are called the Mersey and North Cheshire Greyhound Trust we have volunteers ideally placed ready to help you in most towns in the North West, Wirral, Manchester, Cheshire and North Wales areas. Our kennels are ideally situated 5 minuets from junction 7 of the M62, so we are well placed in experience and location to help you give one of our loving greyhounds their forever home. When you have seen the rest of our site, don't forget to visit the "Contact Us" page and get in touch. On the left you will see links to the various parts of the web site. We suggest that you start with the "About Us" link so that you can find out who we are and what we believe in. When you are ready to see our dogs just click on the "Please Choose Me" button on the left and you will see a small thumbnail picture of the greyhounds that we have available for you to choose from. If you click on the small picture you will be able to see a bigger one with a description of each dog. Just click the "Back" button under each picture to return to the "Please Choose Me" page. 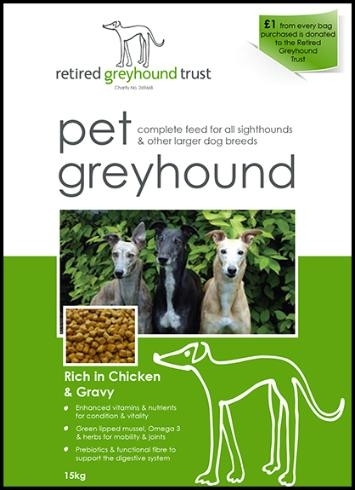 This new dog food has been created with everything your greyhound needs in one complete food. It is manufactured by Dodson & Horrell and produced in conjunction with the Retired Greyhound Trust. 2 x 15kg bags for £40 delivered to your door!